Don’t trash your pumpkins, compost them! When you switch off your porch light on Halloween night, remember to toss your jack-o-lantern in your yard waste container, not in your trash. The City of Iowa City’s organics (yard and food waste) program accepts pumpkins. 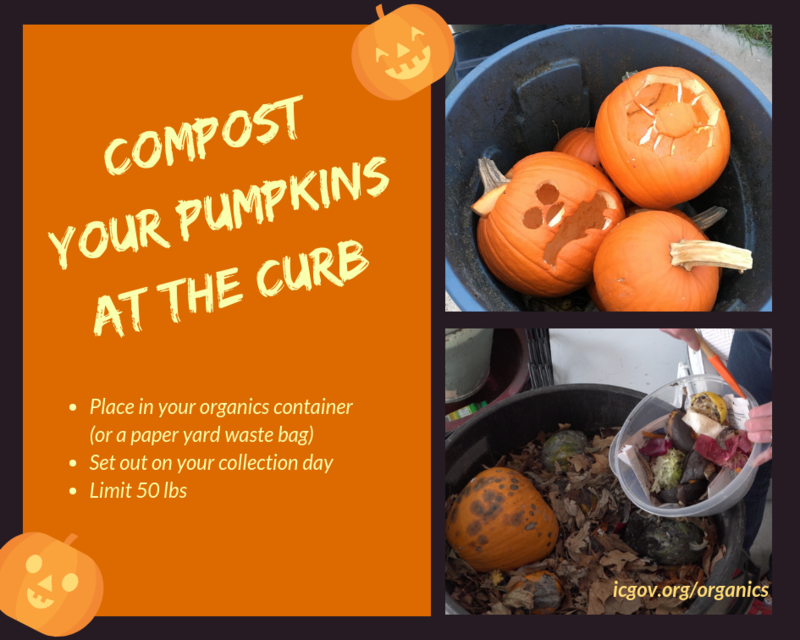 To compost, remove any candles or lights from inside your pumpkin and place it in your 20-35 gallon size organics container, or in a brown paper yard waste bag. Then set it at the curb for collection on your normal service day. Limit 50 pounds per cart or bag. Residents who do not receive curbside services can take pumpkins at no cost to the City's compost facility located at the Iowa City Landfill and Recycling Center, 3900 Hebl Ave SW.
Iowa City residents who receive curbside trash and recycling service are also receiving organics services as part of their monthly utility bill. Residents no longer need to purchase official City of Iowa City yard waste bags or annual stickers to receive this service. To participate, simply combine food and yard waste in the same container and set out for collection. Do not place food waste in paper yard waste bags. To learn more about the program, visit icgov.org/organics, or call 319-887-6160.